More than 4,000 people of Naria Upazila in Shariatpur have become homeless due to the erosion on the Padma River in the last seven days. 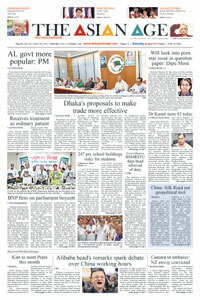 The upazila's Muktarer Char, Kedarpur Union and 4 No. ward of Naria municipal area went under water due to erosion in the past last two months, according to the local government. At least 4,000 people from these areas have lost everything and have been living without shelter, said Sanjida Yasmin, executive officer of Naria Upazila, reports bdnews. At least 200 businesses at Sadhur Bazar and 200 shops in the Wapda Bazar area have been taken by the river, she said. A large portion of 200-year-old Mulfathganj Bazar went under water last week. Mulfat Bazar, Char Jujura village, Daspara and Uttar Kedarpur were among the areas hardest hit by erosion. In addition to homes, all of the roads, bridges, culverts and the others infrastructure in the area have been submerged. River erosion devoured thousands of acres of farmland. More than eight hundred local businesses are also at risk and residents are shifting their houses and shops elsewhere.One portion of Naria Upazila Health Complex's mosque has already gone under water, while the rest is likely to be submerged soon. "Padma is now at the gate of Naria Health Upazila Complex. It could be submerged at any time and, as a result, Naria residents will face a severe crisis. The government should take action to protect the hospital as quickly as possible," said Dr Golam Farque. "The hospital is shifting its emergency services to a residential building," said hospital staff nurse Rozina Akter.The victims say local officials are not concerned by the suffering of those affected. Even the aid they do receive is not sufficient to meet their needs.Khokhon Khan, resident of Char Jujura village, said: "We have lost everything to the Padma erosion. Now we are living in miserable conditions." "We cannot help them further due to the lack of funds in the union council, said Chhana Ullash, acting chairman of Kedarpur Union. "Rice, housing materials and dry food have already been provided from the local administration," said executive officer Sanjida Yasmin.Twenty families affected by the erosion in the Sadhur Bazar area have been provided Tk 10,000 in aid.